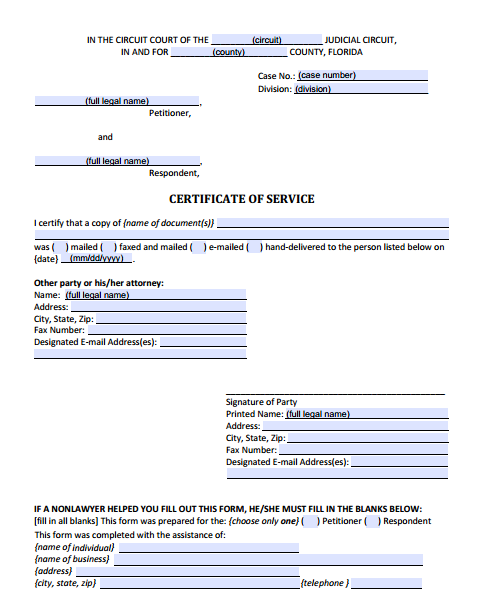 PDF Fillable Form 12.914 Certificate of Service. After a petition or supplemental petition has been properly served through either personal service or constructive service, both parties must serve copies of all additional documents or papers they file with the clerk on the other party, or his or her attorney. Each time you file a document, you must certify that you provided the other party with a copy. If a form you are filing has a certificate, you do not need to file a separate Certificate of Service. However, each time you file a document that does not have a certification of service, you must file a Certificate of Service, Form 12.914, and serve a copy of the document on the other party.